As the UI's international community grows, so does student appreciation for multicultural learning. "Wherever you're from, whoever you are, you are welcome here." The sign—posted alongside world flags at the Pappajohn Business Building at the Tippie College of Business—celebrates diversity at the University of Iowa, where international students make up 13 percent of the overall population. 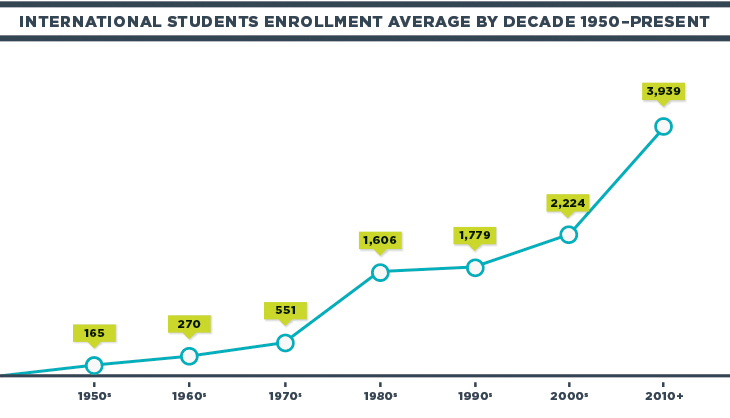 Within the past decade, the UI has doubled its international student enrollment, a spike largely attributed to the growing number of Chinese families able to afford sending their children to college in America. Chinese undergraduates are increasingly drawn to the UI due to its high rankings in U.S. News & World Report, the university's Chinese social media presence, word of mouth from other students, and Chinese President Xi Jinping's longstanding personal friendship with Iowa. Says senior international admissions counselor Adam Parker, 12BBA: "Because of this, the people of China see the state of Iowa in a very favorable light." 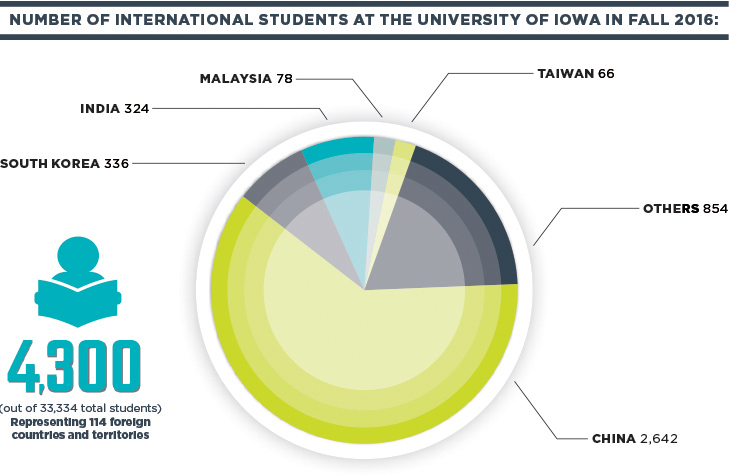 Beyond China, the UI's international students represent 114 nations and territories. They not only contribute $146.6 million to the local economy and support 1,805 jobs, but also reflect the UI's values and educational mission. These students nurture an inclusive campus community where people of diverse cultural backgrounds can come together to learn from one another and develop understanding. "To have international students around provides different perspectives and an appreciation for our differences, too." This multicultural landscape encourages both international and domestic students to reach out and grow in and outside the classroom. Gordon Louie sees the rewards firsthand through his work with the cultural exchange program International Buddies, offered through the Tippie College of Business. "It could be pretty insulated here and easy to avoid things unfamiliar," says Louie, the college's assistant director of global community engagement, "but to have international students around provides different perspectives and an appreciation for our differences, too." Now more than ever, the UI has been working to accommodate the needs of its booming international population with programs and services that support the transition to American collegiate life. In addition to facing the same challenges as any domestic student—such as being away from home for the first time and succeeding in a rigorous academic environment—international Hawkeyes must also adjust to an unfamiliar language and culture. Well aware that many international students still face barriers that keep them segregated in their comfort zones, reluctant to ask for classroom help, and with few American friends, the University of Iowa remains committed to providing a truer cross-cultural experience for all. Iowa Alumni Magazine has invited two UI students to reflect on what it's like to live in the university's flourishing global community. Look below to read, in their own words, how those experiences have prepared them for a world that's increasingly interconnected. I met one of my closest friends in college thanks to a missing calculator. One day during my first semester at Iowa, I sat in the Seamans Center engineering library struggling with my "Introductory Physics" homework. I quickly realized that my financial calculator wasn't sufficient; I needed a graphing calculator for my work. After some time and a lot of frustration, it became apparent that lacking the proper calculator wasn't my only problem: I also needed help. I began anxiously packing my bag, deciding I would have to go to a TA or tutor to understand the homework and succeed in the class. At that point, Changhao walked up to ask me if I needed help and offered his graphing calculator. This kind gesture launched a lasting friendship between us that includes studying together multiple times a week, enjoying conversation over meals, and going sailing. Looking back as a senior, it seems senseless that I didn't approach and ask Changhao for help in the first place. Then again, I've seen many students hesitate to interact—especially with someone who may seem foreign to them in both appearance and culture. Changhao reminded me that making the effort to reach out can do a lot more than provide you with a graphing calculator; it can offer you a friend for life. Enriched by Changhao's friendship, I now work to help break the ice between international and domestic students as a member of the Tippie College of Business's Global Engagement Student Advisory Board. GESAB brings together student leaders from various backgrounds to launch programs that help Hawkeyes overcome barriers to building intercultural friendships. These initiatives range from student art shows to pumpkin carving. One particularly successful program that pairs domestic and international students together is Tippie Buddies, which hosts various cultural and social events. This semester, we had more than 200 participants—our largest number yet. To questions such as "What is the importance of this interaction? What do international students provide that domestic ones do not?" I want to share with you the perspective I gained during my year studying Mandarin abroad. Every time I walked out of the door in China, I was likely to learn something new. I was extremely eager to go out and order street food, talk to the bus driver, or haggle in the marketplace, because even the simplest acts could lead to an exciting adventure. In this manner, I made friends, learned the language, and, more importantly, learned how others live and think. As an exchange student, I had a great desire to learn, a considerable curiosity, and a dedication and determination that drove me to study overseas. International students at Iowa bring that same energy to campus. That energy and passion is what I want to expose domestic students to at Iowa. Beyond the clear benefits of a broader perspective, cultural understanding, and language exposure, domestic students who pursue intercultural friendships learn to relate with people who think differently than them. In an increasingly connected society, collaboration is the source of new growth. I firmly believe the university's diverse student body prepares graduates for that world. More than three years ago, I was an eager freshman excited at the prospect of thriving on a Big Ten campus. Now, as I bid farewell to my final fall semester at the University of Iowa, I realize that I've come a long way since I first stepped foot in Iowa City. My first few years of college were not easy. Like most young adults trying to find their way through life, it involved all-nighters, soul-searching, caffeine, and a few poor choices. But every hardship was worth it in the end. As I look back, I realize my rich and fulfilling college experience wouldn't have been possible if it weren't for the wonderful people, community, and resources that I had at the UI. I'm originally from Kuala Lumpur, the capital of Malaysia, a Southeast Asian country that occupies parts of the Malay Peninsula and the island of Borneo. Besides our exotic and delectable cuisines, we are also widely known for our lovely beaches, large rainforests, and our diversified culture. Prior to arriving here, all I really knew about Iowa was that it's the heartland of the Midwest. To me, the best thing about Iowa City has always been the people, who pride themselves on being civic-minded and compassionate. I've even been grateful for the falling leaves and snow. Coming from a tropical country, I was ecstatic at the prospect of finally getting to experience the four seasons. Sure, winter can be a pain, but I'm awed at the sight of large flakes floating down to earth. I'm always blown away by the beauty of an Iowa winter. My initial decision to attend the UI was because of its well-known and highly rated psychology program. In my sophomore year, I added journalism as a second major. At first, I did so to improve my writing, but I fell in love with it. Ever since, I've been involved with the Daily Iowan, where I currently serve as the metro editor. Before college, I was unsure of what I really wanted to do. The UI and the Daily Iowan allowed me to discover my passion for writing and journalism—the idea of telling stories that matter, holding the powerful accountable, and helping those in need. That noble mission is why I want to dedicate my life to this career path. In addition, I've made some of my closest friends from the newspaper. For many international students I know, however, such relationships don't come easy or at all. Cultural barriers arise from different languages, customs, and societal norms. So it's understandable why students from both sides often find it hard to interact. Personally, it's been easier for me to reach out to others because of my curiosity and eagerness to learn. I do sympathize with my fellow international students who might find it more difficult to move beyond their tight circles of friends. I'd like to play an influential role in bridging the gap between these two student groups, because they have so much to offer each other. To achieve this goal, I joined the UI's Malaysian Student Society and the International Student Advisory Board. In 2017, the board hopes to conduct a public forum to facilitate discussions between students of different cultural backgrounds. International students can also turn to resources such as the Tippie International Buddies program and the UI Conversation Center as a way to connect with domestic students. In my experience, the best way to engage in dialogue is through active participation. I work at the student newspaper not only to pursue writing, but to also interact with all kinds of people on a regular basis. I believe the best way to learn and grow from differences is to step outside our comfort zones. I know it's enriched my life more than words can say. For more statistics, visit http://bit.ly/interstats. Pre-arrival information sessions held in Beijing and Shanghai each summer for incoming students and parents. Advising through International Student and Scholar Services, University Counseling Services, and the colleges. Life in Iowa programs that build academic skills and provide cultural events such as "Football 101," pumpkin carving, and gingerbread cookie decorating. Global Mosaic Living-Learning Community that pairs domestic and international students and offers related programming in Mayflower Hall. Conversation, speaking, and writing centers to improve language proficiency and build friendships. Graduation ceremony translation available in Mandarin Chinese, Arabic, Farsi, Spanish, and Korean. Friendship matching programs through the university and community. Bridging Domestic and Global Diversity leadership training program that encourages understanding of cultural differences.